Along Highway 5 in Alberta, Canada the scenery in Waterton Lakes National Park is stunning with the mountain range, green landscape and the edge of Middle Waterton Lake. 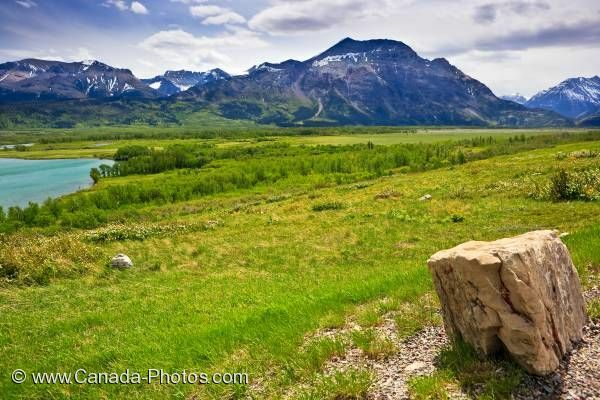 Highway 5 will take you to the beautiful scenery that surrounds Waterton Lakes National Park and this viewpoint along the Highway is an excellent place to rest. The snow covered peaks of the mountain range, green landscape that extends for miles and the Middle Waterton Lake are just a small portion of the scenery in this National Park. Scenery from a pullout along Highway 5 beside Middle Waterton Lake in the Waterton Lakes National Park, Southern Alberta, Alberta, Canada. Picture of the scenery around Middle Waterton Lakes in Waterton National Park in Southern Alberta, Canada.